From the land of Brunei in the northern part of the island of Borneo comes a truly remarkable wild betta. 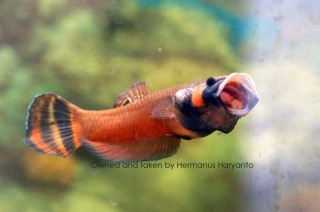 Also known as the Brunei Beauty and Ikan Pelaga Brunei, the Betta Macrostoma(literally “big mouth”) is a mouthbrooding species with a unique history. With the fast social and economic development in Brunei, it was commonly held for over 50 years that the fish was extinct. In 1981,B. macrostoma was”rediscovered” in one of the waterfalls of Brunei Darussalam,leading to fresh excitement and interest in this species. As of this writing, International Union for Conservation of Nature and Natural Resources has classified the Macrostoma as “vulnerable”. Macrostoma male showing how he got his name. Photo by Hermanus. 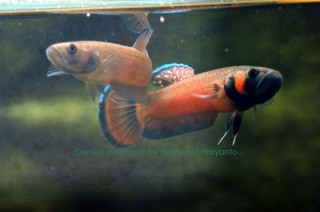 HassanalBolkiah Mu’izzaddin Waddaulah, the Sultan of Brunei, has taken aspecial interest in this fish and has declared it protected in Brunei.It is prohibited to be in possession of, try to catch in the wild, or to keep in captivity any B. macrostoma in Brunei. Moral ambiguity aside, the fish has nevertheless been taken from its homeland and propagated in tanks by hobbyists, and is becoming more commonly available for purchase from breeders out of Thailand and Singapore. However, most serious aquarists and conservationalists agree that, due to the precariousness of the fish’s situation, breeding and keeping Macrostoma should only be attempted by experienced fishkeepers with an interest in perpetuating, rehabilitating, and studyig the species. The Macrostoma can be housed in pairs or kept in special species or certain community set ups. Pairs do very well together long term, and should be kept in well-planted, well-covered tanks of at least 40 gallons. When keeping Macrostoma in pairs or in a group situation, it is not uncommon for spawnings to occur unnoticed,and for fry to be discovered in the tank by the aquarist during normal tank maintenance. Although often labeled a”difficult” fish,Macrostoma can usually be kept very well in most water chemistries, as long as the water quality is well maintained; however the highest incidences of spawning occur in soft water with a pH below6. What seems to be more important to Macrostoma is consistency- they do not do well with shifting water perimeters. They are best kept in the 70 – 75F degree range, and it is imperative that their tank is kept very well covered! Macrostoma is an ingenious jumper with a penchant for finding the very smallest openings in a tank hood, and escaping from them. The fish is omnivorous and does well on a varied diet such as frozen beef heart, bloodworms, daphnia, brine shrimp, and many varieties of prepared and dried commercial foods. 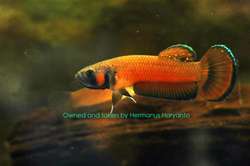 Male Macrostoma are much more vividly colored than the females, displaying brilliant orange-red with highly contrasted black and white markings during courtship and spawning. The female is a rather drab,silver-brown fish with two very distinct lateral bands. It is often possible to seethe female’s ovum by shining a light on her. Macrostoma female (left) and male. Photo by Hermanus. When conditions are met and the female Macrostoma is ready, she will usually initiate spawning. The spawning readiness of the female is fairly obvious with a little observation; she gains very prominent horizontal stripes on the body (similar to the “stress stripes” we observe on Splendens). She will also show two dots around the mouth area and should have a round and gravid abdomen. She will also clamp her fins submissively, and her swimming pattern will vary. Spawning usually lasts between 2-4 hours, with the male wrapping his body around that of the female in typical betta spawning behavior. Both parents assist in gathering eggs as they are released, with the female passing the eggs she has gathered to the male. It isn’t unusual for the female to hold eggs in her mouth for quite some time before the male is ready to accept them. If the male does swallow the eggs, just be patient…the pair will spawn again in around 2 weeks. Male Macrostoma that are holding eggs have a very distinct ‘bulldog’ look,with the lower jaw protruding and the mouth obviously full.Incubation lasts around 30-35 days, and the male will not eat during this time.The fry are released in batches at around 0.5 – 1 cm long,fully independent and large enough for bbs. There are some breeders who insist the male Macrostoma be isolated after spawning and until release of the fry, at which time he is removed. Others can and do keep the pair together during the entire holding period and report cooperation from both parents in the care of the newborn fry. There has been some report of cannibalism the longer the parents are left with the fry, so if the breeder desires to preserve all or most of the fry,the pair should probably be removed after 5-7 days and the fry left to fend for themselves. As soon as the fry emerge, they will need to be fed. Macrostoma fry do very well on the same first foods as other bettas: bbs, microworms, vinegar eels and other small nematodes.In large, well filtered and well planted tanks it is not unusual to keep a breeding pair together, spawning at will and cohabiting with their offspring. If there is adequate cover, Macrostoma fry and juveniles are fairly adept at escaping pursuit, and can be removed from the breeding tank as they become large enough to net. 2 month old Macrostoma juveniles. Photo by Hermanus. 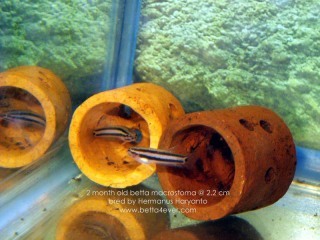 Macrostoma juveniles will be around 2 inches long at the age of 6 months with proper food and tank maintenance. At this time, certain individuals can be identified as males, and it will be easy for the breeder to separate them. Few can argue that the Macrostoma is a rare and breathtakingly beautiful betta. With more aquarists taking an interest in this fish, the Beauty of Brunei may very well be on its way to a more accurate understanding and resurgence. Special thanks to Hermanus Haryanto for his contribution to this article and use of his photos.